just a few key endgame techniques will dramatically increase your confidence, as you will understand what positions to aim for and which to avoid. Starting with the basic mates and the simplest pawn endings, this book provides all the endgame knowledge that players need to take them through to club level and beyond. Müller carefully guides us step-by-step through a fascinating range of endgame tactics and manoeuvres, helping us understand the underlying logic. Throughout the book, many cunning endgame tricks are highlighted. You will have fun springing them on friends, family – or your opponents in serious tournaments. 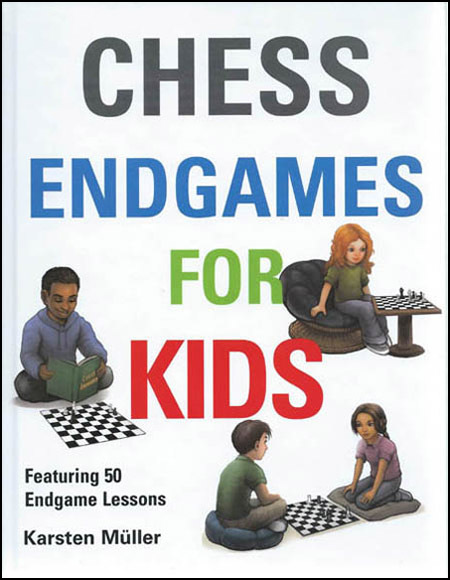 Chess Endgames for Kids makes learning chess endgames fun. But it is also a serious endgame course written by a leading endgame expert, and provides a firm basis for vital skills that will develop throughout your chess career. German grandmaster Karsten Müller is arguably the world’s foremost writer on chess endgames. Whenever an interesting endgame occurs in a high-level game, the chess world knows that it will soon be dissected and explained by Müller. Whether writing for a low-level or high-level audience, his infectious zeal for the endgame shines through.